If you’ve recently spent the time and money to get new hardwood floors installed, you probably want to do everything you can to keep them looking great for as long as possible. And in order to do that, it’s important to understand how the delicate balance between moisture and hardwood floors works. Because wood is a natural product, it’s highly affected by moisture levels, both on the wood itself and in the air around it. In fact, it’s been shown that moisture can cause wood to expand by up to 30% AND shrink by up to 30% as well. And what’s more, this expansion and shrinkage doesn’t always happen equally in all directions – and that can have a huge impact on the way your hardwood floors look. When moisture levels are too high, the boards of a hardwood floor expand, eventually bumping up against each other and causing a “cupping” effect when they run out of room to grow. You can see this cupping easily when you look at your hardwood floors – the sides of each board will be higher than the middle, creating a cup-like shape when you look at the board side-on. The opposite happens to your hardwood floors when moisture levels are too low. When humidity in the air dips down, the boards of your hardwood floor will contract, leaving large empty cracks or gaps in between. If you’re seeing either cupping or cracking in your hardwood floors, it’s important to figure out what’s causing moisture levels to be too high or low for your floors. Moisture issues can come from a variety of sources, including leaky or broken pipes, water spills that aren’t cleaned up, improper care and cleaning techniques that use too much water, and natural seasonal variations such as high humidity in the summer and low humidity in the winter. Decrease moisture level and/or eliminate the source of the water (water could be coming from a pipe leak, spills that aren’t cleaned up, and/or humidity in the air). Apply heat to help with the drying process. Circulate the air with a fan. In more extreme cases where you’re unable to resolve cupping on your own, consult a professional for assistance (see below). Increase humidity in your home by installing a humidifier. Use dehumidifiers/humidifiers to maintain even moisture levels in your home throughout the year. Clean your hardwood floors with a recommended cleaning product on a damp cloth – do not use water or water-based products on a regular basis. Mop up water spills as soon as possible. Once you’ve gotten moisture levels under control, it may be necessary to refinish hardwood floors by sanding and re-coating. This is where the professionals come in! It’s important to trust your hardwood floor refinishing projects only to qualified professionals, especially when it comes to moisture and hardwood floors. Sanding hardwood floors too soon before moisture levels have fully equalized can cause a reverse affect known as crowning (crowning happens when the raised edges of the cupped boards are removed by sanding hardwood floors. Then when moisture levels go down further, the board returns to its natural state except that now the edges are not as tall as they used to be. This results in a convex shape, or crown, as you look at the board side-on). For assistance with hardwood floors in Atlanta, including refinishing hardwood floors, sanding hardwood floors, and any other hardwood floor issues, give us a call at 770-451-2270. 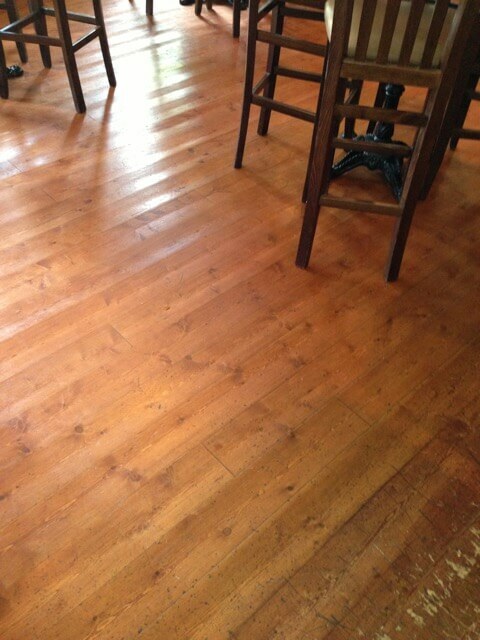 Peach Design, Inc is Atlanta’s hardwood floor specialist! Contact us today for a free quote. I am interested in getting some hardwood floors installed into my home so I’ve been looking online for tips on how to properly maintain them. I didn’t know moisture can affect these floors. I’ll follow your suggestion and get a dehumidifier for our home. My wife and I just moved into a new home and want to install some new hardwood floors for the living room. I had no idea that moisture could cause wood to shrink or expand by up to 30%! We’ll have to find wood that is acclimated and eliminate any sources of moisture like you suggested. Thanks for sharing! Great Job! Wow Thanks for all your efforts that you have put in this. very interesting information. i like your ideas in your article, and looking forward to your next article. Thanks for sharing these very informative article. I think that it is very important that we know the details of the floor that we have in order for us to take care of it properly. I will try to follow what you said.I think that it would be very helpful.